It’s one of the only countries in the world where the president is popular. Will Trump return the love? HANOI, Vietnam — Before every shift at a Domino’s Pizza store in central Hanoi, Van Nguyen Hai, 20, puts on a uniform in the colors of the American flag. Then she takes up her position behind the register, in front of a wall decorated with a collection of images that represents milestones in the history of Domino’s: the flag of Panama, where the chain’s 8,000th store opened in 2006; a steaming brownie, in honor of a dessert the chain introduced that same year; and the logo for “The Apprentice,” which held a Domino’s-related challenge in 2005, featuring a tie-clad Donald J. Trump. In the country where thousands lined the streets to chant “Obama, Obama” in 2016, many Vietnamese like Hai are also eagerly awaiting Trump’s upcoming visit to attend the Asia-Pacific Economic Cooperation meeting in Da Nang and meet with President Tran Dai Quang and other Vietnamese officials in Hanoi. In fact, when Trump lands on Friday in Da Nang—at an airport where U.S.-Vietnam teams are still finalizing efforts to clean up dioxin contamination left by American Agent Orange during the Vietnam War—he will enter one of the only countries on earth where he, and the country he leads, are both popular. What does this communist country see in the real estate mogul-TV star who now serves as the 45th president? Trump’s strong support in Vietnam is partially borne of his own policies and personality: His campaign trail tough talk on China resonated with a Vietnamese public deeply suspicious of their northern neighbor’s rise, and Trump’s business experience is appealing to many in a country where break-neck economic growth has recently fueled entrepreneurial dreams. His visit here is eagerly awaited—both by those excited to see a leader they admire, and by those hoping that concerns about Trump’s commitment to Vietnam will be assuaged. 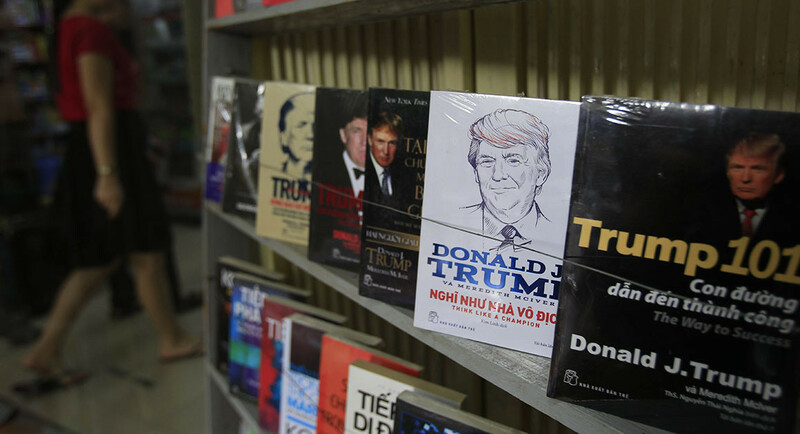 Before he became president, Trump was well-known in Vietnam as a successful businessman. In the three decades since the country began market reforms known as Doi Moi, entrepreneurs have been celebrated as engines of growth; almost 20 percent of the adult population in Vietnam owns their own business, the third-highest rate of 60 countries surveyed by the Global Entrepreneurship Monitor. The 20-year-old founder of the Vietnamese for Donald Trump Facebook page—15,000 followers and counting—is among those drawn to Trump’s business background. (He requested anonymity because his Trump fan page, which he also describes as “a fan page for American conservatism,” contains some criticism of the government.) To this young man, who calls himself a “Vietnamese deplorable,” Trump represents the best of America—“capitalism, freedom and God,” he said in a telephone interview from his home in Ho Chi Minh City. Still, there is hope here that Trump’s visit—marking the first time the president of the United States has been to Vietnam two years in a row—will confirm that American interest in Vietnam will outlast the Obama administration. Professor Nguyen Thi Thanh Thuy, head of the Americas studies division at the University of Social Sciences and Humanities in Hanoi, says expectations are high that Trump’s address at APEC—which the White House has said will outline “the United States’ vision of a free and open Indo-Pacific region”—will clarify the Trump administration’s commitment to Vietnam. “I think the Vietnamese people and many people in other countries expect more from the U.S. in order to counterbalance the Chinese policy in the region,” she says. For Vietnam, the United States is an increasingly critical strategic partner as China builds islands and military facilities in the South China Sea. Obama’s 2016 visit confirmed the growing scope of the relationship as the United States lifted the decades-old ban on arms sales to Vietnam. And part of the Obama administration’s “pivot to Asia” strategy relied on pushing forward the Trans-Pacific Partnership, from which Vietnam would have been among the biggest beneficiaries. After Trump’s TPP withdrawal, the Vietnamese government issued a polite response pledging to continue to work for regional economic integration. But Le Dang Doanh, a member of the Committee for Development Policy of the United Nations and one of Vietnam’s leading economists, says, “We regret deeply the step of the president of the United States to withdraw from TPP.” Still, Carlyle Thayer, an expert in southeast Asian politics and emeritus professor at the University of New South Wales, says Vietnamese officials have moved on from the disappointment: “They’re pragmatists. It’s done.” The remaining 11 countries have continued negotiations, and Le is among those who hopes those countries will reach a final agreement at the APEC meeting in Da Nang. The White House visit in May by Vietnamese Prime Minister Nguyen Xuan Phuc, the first by a southeast Asian leader, helped quell Vietnamese concerns that Trump would abandon the Obama administration’s concerted efforts to strengthen the U.S.-Vietnam relationship. But uncertainty lingers. As the lovefest between Trump and Chinese President Xi Jinping in Beijing earlier this week illustrated, Trump has not displayed a strong interest in countering China in the South China Sea, in part because he needs China’s support in curtailing North Korea’s nuclear ambitions. One reason Trump remains popular despite all that is because he and the United States are covered very carefully by media outlets here, which are strictly controlled by the government. Thuy, the director of MDI, says that the long-term importance of the U.S.-Vietnam relationship leads Vietnamese state-run media to cover Trump positively or neutrally. As for how much, or whether, Trump will interact with the Vietnamese people, expectations seem to be lower than for past presidents. Bill Clinton’s visit was a milestone in Vietnam’s international integration. “I remember when Bill Clinton walked around here and went into the shops like a normal person,” Bac Hai, 70, told me recently, sitting by Hoan Kiem Lake, where Clinton strolled in 2000. She preferred Hillary Clinton during the presidential election but has come to think Trump’s business experiences should equip him to appreciate how much Vietnam has developed since market reforms began in 1986. Last year, Obama ate with Anthony Bourdain at Bun Cha Huong Lien, a small, cheap noodle restaurant. Their meal of Hanoi’s most iconic dish—grilled pork patties served with vermicelli rice noodles and fresh herbs—became the most memorable moment of his visit for locals. And the restaurant—where the walls are decorated with photographs of Obama and staff members, and the menu now offers the Obama combo—has seen a business boom ever since. “When Obama came to eat bun cha, people came to see him, because the most powerful man in the world was acting like a normal person, with no safeguards,” Bac Hai says. There’s not much hope that Trump, a self-described “germaphobe,” will venture to Bun Cha Huong Lien or a similar restaurant. The U.S. Embassy in Hanoi referred to a White House news release saying only that Trump will meet with President Quang and other senior leaders. Back at Domino’s, Van Nguyen Hai and her co-workers recently debated Trump as the image of his face gazed down from the wall. Tran Tran Pham, 19, said Trump seemed unkind, imperious and unwilling to work with other countries. Hai agreed partly, but she still said she preferred Trump to Obama because of the power he projects. She said she was a little surprised he is coming to Hanoi, given the length of his Asia trip, but has high hopes.